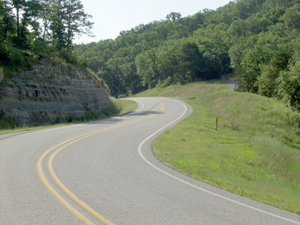 A favorite back roads route from Berryville to Eureka Springs is Arkansas 221 south to County Road 302, - see MAP - known locally as Rock House Road. This is a high energy ride though the hills, down to a swimming hole on the Kings River, called Trigger Gap. 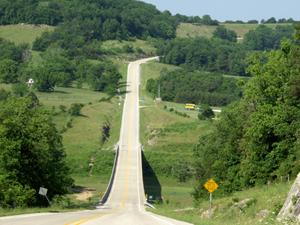 Just past the bridge over the river, County Road 302 heads back to Eureka Springs. It's a very narrow, winding road running through lush, forested land. The entire trip from Berryville to Eureka Springs will take less than 30 minutes. This may well be the best short ride in the Ozarks. It's scenic, twisty and tons of fun. Locals call it "Race Track Road". But don't take that too literally. Though it's enjoyable, take it easy because the unexpected can happen quickly in those tight turns. Watch for First Federal Bank two blocks west of the Berryville Square. Turn right onto 221. 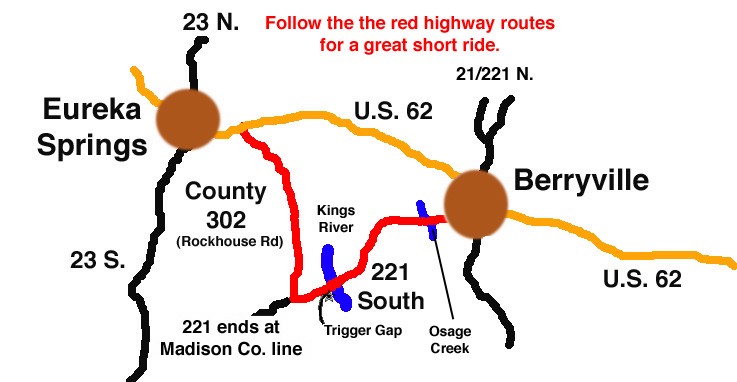 Past Trigger Gap on the Kings River (not to be confused with the Osage River just two miles out of Berryville) watch for Rock House Road - Carroll 302 - for the trip back. The first three miles out of Berryville are mostly composed of long straight stretches and the scenery goes from town to farmland. At about the fourth mile, the road turns wraithlike, winding around the constantly changing scenery... from farmland and valleys to forested woodland. The curves are fairly flat, but soon begin to climb up mountain sides. Once on top, 221 clings to a road bed carved out of the mountain side and becomes knee dragging twisty. Watch for rocks and gravel strewn across the road, and also for domestic and wild animals, and other vehicles in your lane. Speed can get you hurt here. 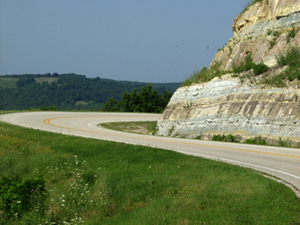 To get back to Eureka Springs, take County Road 302 (also called Rock House road). It leads back to U.S. 62 east of Eureka. This is a very narrow county road through mostly some of the lush forest land of Carroll County. A large amount of the ride will be through a foliage tunnel as the trees arch over the road. 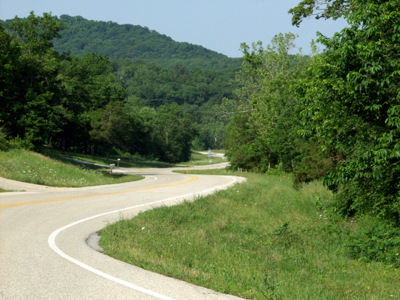 The road is as twisty as it is narrow, and county roads have a speed limit of 45 mph. This road is a great place to relax and enjoy leisurely cruising back to Eureka. Be careful not to get lulled into inattentiveness. Just when you least expect it another vehicle or animal may pop up on your side of the "center stripeless" road. As you come down off the mountain, there's a long straight stretch. After you cross the Kings River bridge (heading west) look for the gravel road taking off to the left to the Kings River Outfitters. They own the property around the old abandoned low water bridge. 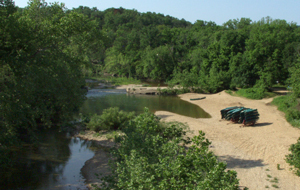 It is a local favorite canoe put-in point as well as a campground and swimming hole. A modest use fee helps them keep the place clean and comfortable. The gravel road goes down hill, so care must be taken going down and back up. It's doable, but take it nice and easy.